I'm not sure if I'm convinced by the much-vaunted 'Essential Waitrose' range. I think they've missed a trick for the middle classes. Instead, I would like to see them bring out a 'Non-essential Waitrose' range of ostentatiously overpriced and unnecessary luxuries for those who wouldn't be seen dead carrying anything from a value range. It would go down a storm with Mrs WP. 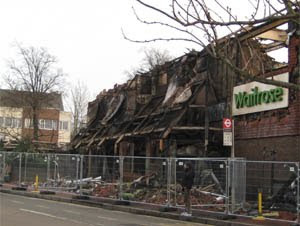 However I digress - it is just over 10 months since I reported on the terrible events in Banstead when their branch of Waitrose burned to the ground. Fortunately there were no injuries, and the store were able to relocate some of the staff to the Worcester Park branch. Within two months, a temporary Waitrose opened in the vacant Woolworths unit in Banstead High Street. Now, the wait is nearly over with the brand spanking newly-built Waitrose due to open by the end of November. It's all happened with very unBritish speed and efficiency - it's almost unnverving. In the meantime, Mrs WP continues to develop her well-honed contingency plan for survival should anything ever happen to Waitrose in Worcester Park.